Education Director General Dato' Seri Dr Khair Mohamad Yusof with students of SMK Taman Tun Fuad and JPN Sabah Director Pn Hjh Maimunah Hj Suhaibul at the Frog Classroom in Kota Kinabalu today for Festival Hari Guru. Here, Pn Julie explains elements of the lesson as Tn Hj Shahirul Amran of YTL Communications looks on. Today, Malaysia’s Director General of Education Dato’ Sri Dr. Khair Mohamad Yusof attended the “Festival Hari Guru” today here in Universiti Malaysia Sabah, Kota Kinabalu. He was accompanied by JPN Sabah Director Pn Hjh Maimunah Hj Suhaibul. Dato Sri Khair and Pn Hjh Maimunah met students and teachers from SMK Taman Tun Fuad who were engaging in a Frog session on Geography, on the topic of Migration. They signed Frog Classroom tables to commemorate the occasion. Education Director General Dato' Seri Dr Khair Mohamad Yusof with students of SMK Taman Tun Fuad. Boys will be boys. The band of brothers from SMK Taman Tun Fuad and their Cikgu getting ready for their Frog VLE Lesson at Festival Hari Guru here in Kota Kinabalu today. It's every teacher's dream that their students become more participative and confident in giving feedback. These boys began using The Frog VLE in their lessons this year. "Kurang mengantuk!" I'm not so sleepy! "Tidak penat menulis!" I do not have to write! "Kita boleh fokus sebab setiap orang ada Chromebook tersendiri." We each have Chromebooks so we can focus better. The interactivity and reduced shyness in being able to speak up via the Sites prepared by their teachers has brought a new sense of ownership to the class. 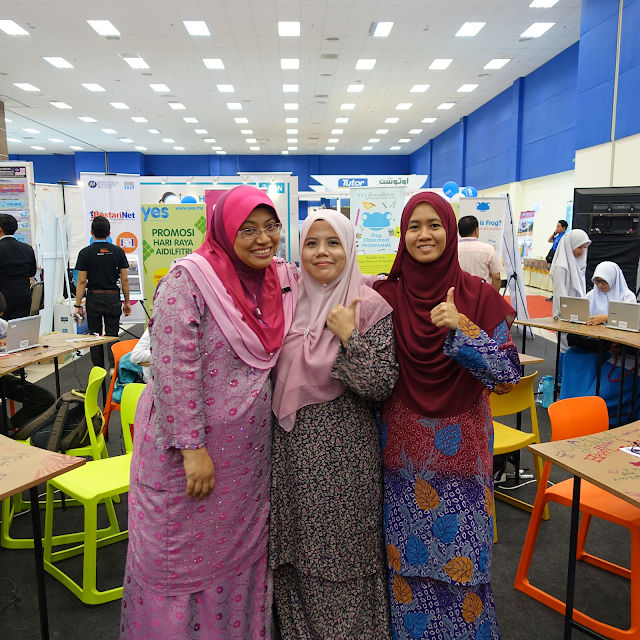 From left to right: Cikgu Julie, Cikgu Dalila and Cikgu Zahiah of SMK Taman Tun Fuad. "Communication is the most important thing," shared Cikgu Julie, who finds her work satisfying, even more so now when her students are speaking up via the Frog VLE. She finds that her students' text-based answers increase in quality as they are more comfortable typing in feedback then writing by hand. Cikgu Julie shares that she also uses the Frog VLE to stay organised. "After I'm done with my lesson, I can download everything to share as a report," she explained. "We'd like to share Sites with other teachers so that they'll be able to access it and use it, so that it's a collaboration with more schools," shared the three teachers when we chatted to them today. With the kind of enthusiasm that they share, it's hard not to smile! Here's to 21st century schools in Sabah! We hope to see many more of you here in our Frog Classroom at Festival Hari Guru, Kota Kinabalu.